Read about what Basic Disclosures are, how Basic Disclosures work and how you can apply for Basic Disclosures on your staff. Basic criminal record checks can be processed online or via a paper application form quickly and easily. DDC process Basic criminal record checks electronically through the DBS and Disclosure Scotland depending on the location of staff. A Basic Disclosure check can be requested for any role, with the consent of the applicant. It is particularly useful where employers have some roles that are not eligible for a Standard (e.g. Financial Services positions) or Enhanced (e.g. working with children) check, but wish to set a policy that all staff and contractors should be pre-employment checked at some level. 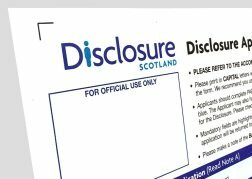 Basic Disclosures are available through DDC Ltd from an organisation called the DBS (Disclosure & Barring Service) for those individuals working in England and Wales, and through and organisation called Disclosure Scotland for individuals working in Scotland. DDC are a Responsible Organisation for the DBS and a Registered Body for Disclosure Scotland, and are set up and processing checks electronically through both Authorities. After completing the required steps, the DBS or Disclosure Scotland will issue a Basic Disclosure certificate. A Basic Disclosure will show convictions considered unspent under the Rehabilitation of Offenders Act (1974) as amended by the Legal Aid, Sentencing and Punishment Act 2012. This differs from a Standard or Enhanced criminal records check, which will contain information on spent convictions as well as any Vetting and Barring information requested, subject to the DBS Filtering Rules. Basic Disclosures are available in addition to Subject Access Reports issued by the police, which individuals can obtain from their Local Police Force under the Data Protection Act, and Police Certificates for foreign visas etc., which are issued by the Association of Chief Police Officers. What are spent and unspent convictions? What is the difference between a Subject Access Request, a Police Certificate and a Basic Disclosure? What is the difference between a Disclosure and a CRB/DBS Check? Start requesting checks by registering here. Anyone can request a Basic Level Disclosure Check. An interested party, such as an employer, may request a Basic Check on another individual, provided the subject of the check has given their consent. Doing the check through an Umbrella Body like DDC ensure you receive all information as accurately as possible. When checking a large workforce this may also present an administrative problem to ensure all applicants submit their information correctly and provide their results to the correct person. DDC can ensure this process is administered from start to finish. DDC offer a managed service that takes over responsibility for the process, making sure that the appropriate documents are sent to the applicant, the application is completed accurately and is submitted to the DBS or Disclosure Scotland by us in a timely manner. With the consent of the applicant, you are able to keep the Basic Disclosure certificate on file and you can rest assured that the information provided by the DBS or Disclosure Scotland is accurate and is related to the correct individual. A Basic Disclosure application can be initiated online via your personal DDC Client Area and the applicant will complete an online application form issued, via email by DDC. Paper applications forms are available and can be requested via the online Client Area. For more information about the online or paper application process please go to our online process or paper process overview pages or register now to set up a free account. If an individual wishes to request a Disclosure upon themselves, they will be issued with a Basic level certificate directly from the relevant Authority. Asking an employee to carry out a Basic check on themselves may represent a risk to an employer, as the subject of the check is also responsible for submitting the relevant documents and providing the results. If applying for a Basic check upon yourself you can contact the DBS or Disclosure Scotland directly. At DDC, we have been operating an online application process since 2009 and a paper-based application process since the very first days of the CRB (now DBS) and with Disclosure Scotland for Basic checks. Our process starts with the Client providing some basic contact details for the applicant. Once we have this information, we are able to guide the applicant through the process, online or paper, send out email notifications, post out the correct forms and deliver the appropriate information. We offer a comprehensive tracking system so that our Clients can see exactly where the application is within the process at any given time. Our systems are also designed to be flexible enough to accommodate a range of different organisational structures and management preferences. If you have any specific requirements please give us a call on 0845 644 3298 and we can discuss how our system can be tailored to provide the ideal solution to your online Basic Disclosure process. Can I use the e-Bulk system for Basic-level checks or PVG applications?